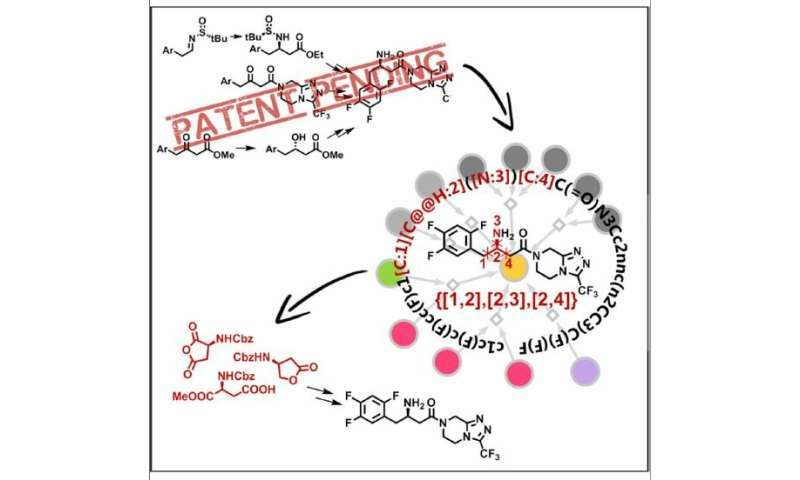 "When we started this project, I was somewhat skeptical that the machine would find any viable synthetic alternatives—after all, these are blockbuster drugs worth gazillions of dollars, and I was sure that the respective companies had covered the patent space so densely that no loopholes remained," says senior author Bartosz Grzybowski, a professor of chemistry at the Ulsan National Institute of Science and Technology (South Korea) and the Polish Academy of Sciences and the lead developer of the organic synthesis software Chematica. "It turns out that the loopholes are there, and we can find new retrosynthetic pathways that circumvent the patents entirely." Those pharmaceutical patents protect the company's intellectual property while also preventing competitor companies from using certain key synthetic solutions—developed painstakingly by experiment to maximize yield, increase purity, and reduce costs—when attempting to produce desired compounds. To get to viable unpatented options, the researchers "froze" challenging portions of each target molecule, forcing the computer to substitute unconventional yet chemically plausible approaches on the basis of mechanistic rules. They tested their system out on three notable commercial medicines with different chemical hurdles: linezolid, a last-resort antibiotic; sitagliptin, an antidiabetic drug; and panobinostat, a multiple myeloma treatment. "Intellectual property" is an illegitimate concept that is impossible to enforce. Those who defend the concept are the enemies of free thought, and liberty. Don't worry. The software involved will eliminate patents on (existing) production methods. IANAL, and it will take most of a decade, but it is coming. A new and less expensive way to manufacture a give product or precursor? Have at it. Patents on chemicals not found in the body--or in some other existing lifeform? Again, gets you past the first hurdle (novelty) on patents. Of course, additive manufacturing, AKA 3d-printing, is going to induce another collapse in what is patentable. If I make a replacement widget for some machine using 3d-manufacturing, to get it faster than ordering from the manufacturer, am I violating the manufacturer's patents?